Iceland is the land of ice, fire and water. The country is situated on a plate tectonic ‘hot spot’ on the earth, resulting in a lot of geothermal activity. This mixture of geothermal activity, ice and fire, means that there are numerous hot springs and geysers all over the country. Here is a list of our top 5 hot springs in Iceland that are free to enter. Reykjadalur (literal translation: ‘Steam Valley’) is one of the easiest hot spring areas to reach from Reykjavík. A short drive (45 minutes) brings you to the town Hveragerði and from there you can hike up to the warm river that flows down Reykjadalur valley. The hike is not very demanding although it does climb quite high at times. You can reach the warm river after about 45-90 minutes (depending on how fast you walk and how often you stop to take pictures of the waterfall in the gorge and all the pretty bubbling muddy hot springs on the way). Seljavallalaug is in the south of Iceland. It’s not actually a natural pool but a man-made 25 meter long and 10 meter wide construction from 1923. The hot water that trickles into it is completely natural though and the pool is constructed into a mountainside in a narrow valley with breathtaking natural surroundings. The pool is a couple of hours drive from Reykjavík, and a very short walk 5-10mins from the car park to the pool. The Landmannalaugar Hot Springs are located in the in centre of the Landmannalaugar Highlands in the Southern Region of Iceland. The Landmannaluagar Highlands are called the ‘Pearl of Iceland’ as they are home to totally unique and incredible mountainous landscapes. The bathing area is quite spacious and the water is relatively shallow, but with enough room to move around a bit. The temperature sits roughly at 36-40 °C, which is perfect for bathing. What brings most people to this area is the epic hiking trails followed by a long dip after a long and rewarding hike. It can only fit 2-3 people but it’s deep enough to cover you to your neck. The unofficial rule is if you see a car at the parking lot, assume the pool is taken and wait a bit for your turn to enjoy this relaxing little gem. Located by the shoreline near Flókalundur, Hellulaug is arguably the most famous hot spring in the West Fjords. The spring is loaded from rocks and concrete so the surroundings are quite different from what you see in other hot springs. The water temperature is about 38°C and it’s the perfect place to end your day if you plan to do some sightseeing or hiking in the West Fjords. Its quite a drive from reyjkavic but worth it if you are in the area. We’re Makai and Lucy from Brighton, UK. 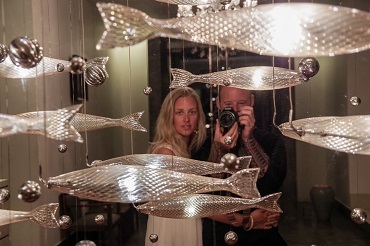 Just two people carving out a lifestyle together where we can spend more time having fun, exploring all the world has to offer and enjoying life, whilst checking out cool places to stay and spreading the love via social media. We’re Makai and Lucy from Brighton, UK. Just two people carving out a lifestyle together where we can spend more time having fun. Copyright © 2017 The Passport Diaries. All rights reserved. Designed by Product London.